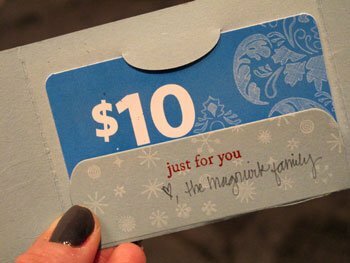 “I give a lot of gift cards to teachers and instructors during the holiday season. Because the gift card, while appreciated, isn’t always the most exciting gift, I like to make the presentation fun and festive. I love being able to use my stamps and tools to create heartfelt greetings and gifts for our friends and family during this special time of year! Use Papertrey Ink Gift Card Holder to die cut gift card from Stampin’ Up Baja Breeze Cardstock. 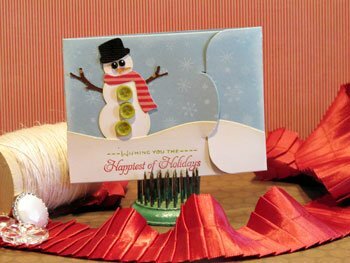 Mask off the parts of the gift card you don’t want to add background stamping to and stamp Hero Arts Tiny Flakes Background on gift card with Colorbox Frost White Ink. 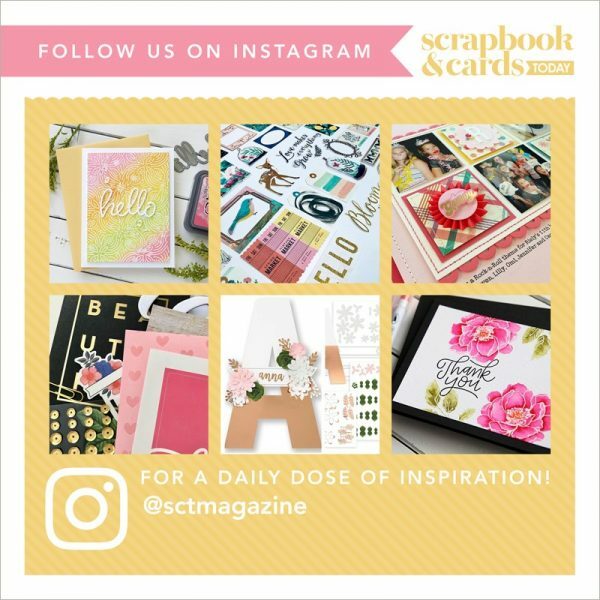 Use Frost White Ink pad to lightly distress edges of card front. Use Papertrey Ink In The Meadow Die to die cut “snow” from Papertrey Ink Rustic White Cardstock. Cut 2 snow borders and lightly ink edges with Ranger Antique Linen Distress Ink using Ink Blending Tool. Adhere one border to the gift card flap and trim excess. Line up other border and adhere to the gift card front and trim excess. Adhering the snow border this way allows for the snow to be continuous when you open the flap. Punch Martha Stewart Snowman and pieces from Echo Park Dots & Stripes Christmas Collection 6×6 papers and cardstock. Assemble snowman as shown and adhere with Glossy Accents. Add detail to snowman using Doodlebug Beetle Black Gems and tiny, tiny green buttons from My Mind’s Eye. Stamp greeting from Papertrey Ink Christmas Poinsettia Stamp Set using Stampin’ Up Real Red and Lucky Limeade Inks. Stamp additional greeting inside card from Papertrey Ink Mat Stack 3 Collection Stamp Set using Stampin’ Up Real Red Ink.